Traditional hand-knitted Aran Cardigan for children Size: small to medium child 26 – 28 ins, 99 - 71cm Choose your Pattern and Colour Various patterns ~ Round, V neck or Polo. 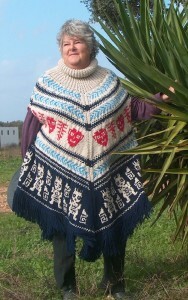 My Aran Cardigans for children are very practical and easy to wash. Just choose your Pattern and Colour! 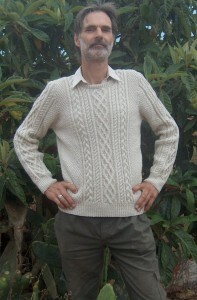 My favourite – Chunky Arran Jumper – in natural coloured wool. Every man should have one! featuring traditional Mayan symbols and patterns.